Marc Lamber and James Goodnow interviewed on GMA. James Goodnow and Marc Lamber join U.S. Sen. Markey and U.S. Congressman Gallego to introduce the HEART Act. CBS Evening News interview with attorney Marc Lamber. James Goodnow provides political commentary for Brahm Resnik’s Sunday Square Off discussing Hillary vs. Trump in anticipation of the first presidential debate. James Goodnow provides commentary on what to expect from Trump’s first 100 days in office. James Goodnow commenting on resignation of General Michael Flynn. Marc Lamber discusses Supreme Court ruling on Whole Woman’s Health v. Hellerstedt with Ted Simons. James Goodnow discusses Trump SCOTUS nominee Neil Gorsuch and the "nuclear option." Marc Lamber discusses the “We Have A Voice Campaign,” and legal action initiated on behalf of his clients on the two-year anniversary of Charlie Vacca’s passing. James Goodnow discussing Trump's SCOTUS nominee, Judge Neil Gorsuch. James Goodnow provides legal analysis on Trump's Travel Ban. James Goodnow provides political commentary for Sheriff Joe’s Paul Penzone ad controversy and AZ becoming a battleground state in the presidential election. James Goodnow and Marc Lamber case covered by CBS Evening News. MSNBC coverage of high-profile case handled by Marc Lamber and James Goodnow. James Goodnow discusses latest developments in Clinton email investigation just days before the Election. James Goodnow providing legal commentary on controversial ad surrounding sheriff election. James Goodnow provides legal analysis on Trump's revised Travel Ban. James Goodnow provides political commentary in conjunction with the highly-charged second presidential debate. James Goodnow breaks down former Trump national security advisor Mike Flynn's immunity request. James Goodnow discusses legal implications of Department of Justice’s case against Sheriff Joe Arpaio. James Goodnow discusses the potential of hackers disrupting the presidential election. James Goodnow provides legal analysis for Paul Penzone’s defamation lawsuit against Joe Arpaio over controversial ad. James Goodnow analyzes the legal and political ramifications of the presidential election being hacked. Attorney James Goodnow discussing the possibility of hackers hijacking the presidential election. James Goodnow interviewed about the political and legal fallout of the ongoing Hillary Clinton email controversy. James Goodnow providing analysis on legal hurdles that President Trump may face. James Goodnow discussing if Attorney General Jeff Sessions committed perjury. Marc Lamber discusses implications of Hillary Clinton email controversy. James Goodnow analyzing Trump's SCOTUS pick, Judge Neil Gorsuch. James Goodnow interviewed on the different versions of Populism at play in the campaigns of Sanders and Trump. James Goodnow provides legal analysis in light of appeals court ruling in favor of Sheriff Arpaio’s immigration raids. James Goodnow interviewed on how millennials may impact the presidential election. Marc Lamber provides legal analysis on Merrick Garland’s nomination to the Supreme Court. James Goodnow discussing fallout over court's hearing on Trump's Travel Ban. Marc Lamber comments about NFL class-action concussion settlement. Marc Lamber discusses privacy vs. security issues involving terrorism on social media. James Goodnow interviewed live in studio about the “We Have A Voice" campaign. Personal injury attorney Marc Lamber speaks about Social Host Liability. Marc Lamber shows off cutting-edge legal technology, including innovative uses of Google Glass. Marc Lamber explains why children may not be safe on school busses and why the law needs to be amended. Marc Lamber discusses school bus safety and proposed legislation. Marc Lamber appears in Governor’s office video about Social Host Ordinances. Personal injury lawyers Marc Lamber and James Goodnow featured for their use of iPads and technology. Marc Lamber discusses social host responsibility on New Year’s Eve. James Goodnow discussing court's refusal to reinstate Trump's Travel Ban. James Goodnow discusses Trumpcare, Arizona politics, and more. James Goodnow provides next legal steps for Trump's Travel Ban. James Goodnow discussing Reince Priebus and White House communications with FBI. James Goodnow commenting on Trump's SCOTUS nominee, Neil Gorsuch. James discussing the Invisible Kid Halloween costume. Marc Lamber on the legal implications of the FBI obtaining a master key to crack iPhones. James Goodnow explains legal implications of bombshell Comey memo and responds to arguments from CNN Contributor and show guest Jeffrey Lord. James Goodnow on 4th Circuit Upholding Trump Travel Ban Freeze. James Goodnow breaks down legal arguments about whether President Trump obstructed justice by firing Jim Comey by debating himself. James Goodnow provides legal analysis of whether President Trump may have obstructed justice by firing Jim Comey. James Goodnow recapping James Comey's testimony. James Goodnow provides legal analysis of Jeff Sessions' testimony before Senate intel committee. James Goodnow breaks down the revelation that Donald Trump is being investigated for obstruction of justice. James Goodnow provides legal analysis of Joe Arpaio trial. James Goodnow discussing former sheriff Joe Arpaio's upcoming trial. Marc Lamber Interviewed by CBS This Morning About Significant Case Lamber Goodnow Team is Handling Involving United Airlines. Barbara Jones, Lamber Goodnow Team Client, With Marc Lamber Discussing "Luke's Law" Legislative Initiative. James Goodnow on 12 News Discussing the Legal Implications of Donald Trump Jr.'s Tweets and Emails. James Goodnow Breaks Down the Legal Issues at Stake in the Donald Trump Jr. Email Scandal for Fox 10. James Goodnow Breaks Down the Significance of the Donald Trump Jr. Email Bombshell. James Goodnow Discusses Legal Implications of Donald Trump Jr.'s Meeting With Russian Attorney and New GOP Healthcare Bill. James Goodnow Weighs in on Sheriff Joe Arpaio Being Found Guilty of Criminal Contempt. James Goodnow LIVE on CBS-5 Providing Legal Analysis As Former Sheriff Joe Arpaio Is Found Guilty of Contempt. James Goodnow Live and on Set on 3TV Providing Legal Commentary About Sheriff Joe Arpaio Conviction. James Goodnow Breaks Down Legal Implications of Joe Arpaio's Criminal Conviction. James Goodnow Explains First Amendment Implications of Trump AZ Rally. James Goodnow discussing Bill O'Reilly and the cost of silence. Marc Lamber provides legal analysis on first amendment issues. Marc Lamber interviewed about legal ramifications following self-driving vehicle accident. Marc Lamber provides legal analysis after a high-profile incident at Starbucks. Marc Lamber featured in a segment highlighting advancements in car safety. Marc Lamber interviewed discussing wildfire liability. Marc Lamber interviewed on latest developments in self-driving cars. Marc Lamber discusses holiday social host responsibilities. James Goodnow writes in Forbes that the president’s Supreme Court picks will have a huge impact on businesses. James Goodnow offers legal insight on President Trump’s revised travel ban for ABC News. On NBC News, James Goodnow analyzes the legal complexities of Trump’s brands during his presidency. USA Today highlights Marc Lamber and James Goodnow’s use of iPads to stay connected with clients 24 hours a day. Marc Lamber interviewed by Phoenix Business Journal discussing possible legal fallout after high-profile self-driving car fatality. The Washington Post spotlights a major case represented by James Goodnow and Marc Lamber. James Goodnow provides analysis of how Trump's tweets can be used against him in court. Marc Lamber and James Goodnow offer Fox News insight into a major legal case. James Goodnow tells Forbes business leaders how to recruit and inspire Millennials to succeed. James Goodnow comments on the legal challenges facing Trump’s revised travel ban. Apple spotlights Marc Lamber and James Goodnow’s cutting-edge iPad strategies. The Los Angeles Times reports on a high-profile case represented by Marc Lamber and James Goodnow. James Goodnow comments on the complexities of wearable tech and data hacking for CNBC. Forbes interviews Millennial attorney James Goodnow about his advice for Gen Y workers starting new jobs. James Goodnow uses Google Glass to help his clients generate compelling evidence, writes the Wall Street Journal. James Goodnow outlines successful negotiation strategies for business leaders in Forbes. James Goodnow discusses the free speech debate over negative consumer reviews with The Washington Post. Marc Lamber and James Goodnow featured in bluelock’s 2018 Legal Technology Predictions. Marc Lamber advises business owners about protecting themselves from Americans with Disabilities Act lawsuits. James Goodnow was an early leader in legal content marketing and video education, writes Inc. magazine. Marc Lamber navigates the legal issues involved in self-driving cars and technology-equipped vehicles. James Goodnow analyzes the FBI’s decision on the Clinton email controversy for Fox News. James Goodnow advises Millennials that taking occasional risks can pay off financially. James Goodnow offers Millennials strategies they can adopt now to retire at 65. Political commentator James Goodnow forecasts the important issues developing in the first Clinton-Trump debate. James Goodnow tells People magazine about an unexpected turn in a major case. Marc Lamber and James Goodnow inform Inside Edition about a campaign to change the law following a significant case. James Goodnow interviewed by The Arizona Republic providing legal analysis of defamation and free speech implications in regard to intense, nasty sheriff election race. CBS News features a gun safety case handled by Marc Lamber and James Goodnow. James Goodnow offers analysis of Neil Gorsuch’s nomination for the Supreme Court. Marc Lamber and James Goodnow save clients time by Skyping on iPads, writes the Financial Post. James Goodnow tackles the tricky legal issues surrounding speed cameras. 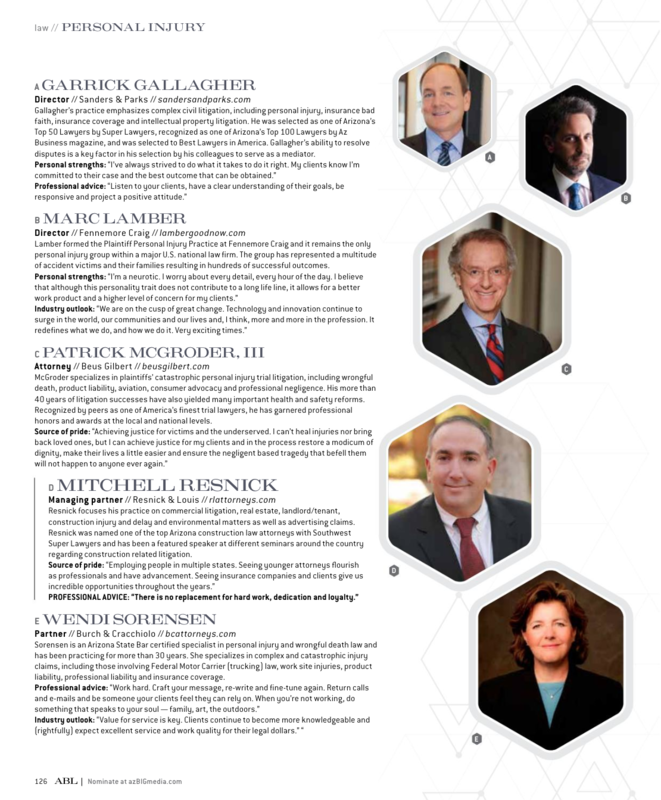 Marc Lamber named to the AzBusiness Leaders 2019 list by AzBusiness Magazine. James Goodnow warns buyers about untested hoverboards in the Silicon Valley Business Journal. Marc Lamber and James Goodnow comment on a case that sparked a national conversation. Legal analyst James Goodnow weighs in on a highway shooting case. James Goodnow forecasts how Amazon Echo and Google Home recordings might be used as evidence. Marc Lamber and James Goodnow tout the benefits of 3-D printing to bolster their clients’ cases. James Goodnow discusses unsafe children’s toys with ABC 15, just in time for Christmas. Forbes Legal Council interviews member James Goodnow about his team’s technology-driven practice. James Goodnow is interviewed about the danger of unregulated water parks. Marc Lamber comments on potential legal changes sparked by a high-profile case. Marc Lamber and James Goodnow outline how iPads help them build stronger legal cases. James Goodnow highlights generational differences in why employees refuse requests at work. James Goodnow explores the legal pitfalls of restraining orders and social media. Marc Lamber explains how his team is harnessing technology to present evidence in a more powerful way. James Goodnow gives InformationWeek readers insight into the legal aspects of wearable technology. James Goodnow comments on the pros of photo enforcement cameras. Phoenix Business Journal consults James Goodnow about the dangers of a popular Halloween costume. Marc Lamber offers perspective on Americans with Disabilities Act lawsuits. James Goodnow evaluates squatters’ rights and real estate law. James Goodnow is spotlighted for his team’s use of blogging to enhance their connection with clients. Marc Lamber and James Goodnow discuss how they’re reimagining litigation using technology. James Goodnow reveals his secret weapon in court: the Apple Watch. Millennial expert James Goodnow comments on how Gen Y is challenging the traditional wedding registry. Marc Lamber and James Goodnow are named the country’s Best Personal Injury Legal Team. James Goodnow discusses how Apple Watch enhances his team’s relationship with clients. James Goodnow is named one of Arizona’s most influential Millennials. James Goodnow offers CNBC insight into the legal matters surrounding internal identity theft. James Goodnow offers introverts tips for successful negotiation in U.S. News & World Report. James Goodnow interviewed by ABC-15 on Sheriff Arpaio’s immigration raids. James Goodnow provides legal and political analysis regarding Trump's clash with the judiciary. Marc Lamber discusses the implications of a high-profile case in the New York Times. Marc Lamber tells USA Today about the ramifications of head injury lawsuits in youth sports. Marc Lamber advises Entrepreneur readers what to do in a PR or legal crisis. Fox 10 News consults James Goodnow about the potential consequences of the FBI’s Clinton email investigation. James Goodnow interviewed about Donald Trump's ideology and how it impacts the government's response to United Airlines incident involving passenger dragged off plane. Marc Lamber and James Goodnow are interviewed by ABC News about a significant case. James Goodnow analyzes the First Amendment aspects of online consumer reviews. Marc Lamber and James Goodnow write an op-ed about the implications of Neil Gorsuch’s nomination. Marc Lamber and James Goodnow explore the possibility of using virtual reality for presenting evidence in court. James Goodnow and Marc Lamber are profiled for their novel use of Google Glass in court. The Arizona Republic features a case with far-reaching implications represented by Marc Lamber and James Goodnow. Marc Lamber comments on the court battle between the FBI and Apple over iPhone privacy. James Goodnow advises Business Journal readers to ditch hoverboards due to safety concerns. Marc Lamber explains the future of artificial intelligence law. James Goodnow provides legal analysis of Sheriff Joe Arpaio's criminal content trial. James Goodnow breaks down implications of the Supreme Court's ruling in Trump's travel ban case. James Goodnow discusses legal implications of Donald Trump Jr. email revelations. James Goodnow offers analysis of First Amendment issues raised by Trump's blocking users from his Twitter account. James Goodnow explains legal significance of "Pharma Bro" Martin Shkreli conviction. James Goodnow weighs in on conviction of Martin "Pharma Bro" Shkreli. James Goodnow quoted about Joe Arpaio conviction. James Goodnow on KTAR News providing legal analysis in regard to Department of Justice filing criminal contempt charge against Sheriff Joe Arpaio. James Goodnow breaks down the legal and political implications of Jim Comey's testimony. Marc Lamber and James Goodnow debate court ruling in Tom Brady “deflate-gate” matter. Marc Lamber joins KTAR to discuss privacy issues surrounding high profile cases involving Erin Andrews and Hulk Hogan. James Goodnow discusses Trump’s potential business conflicts of interest while President. Are you looking for breaking legal and political scoop? Then look no further. The lawyers and legal analysts at LegalCommentator.com are following the big stories and breaking them down. Our goal is simple: to make every story we cover accessible, jargon-free and relevant to your life.